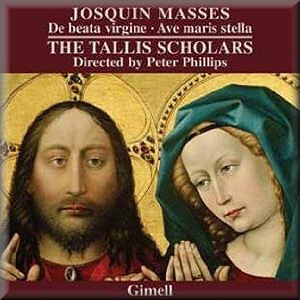 The Tallis Scholars' continuing, if sporadic, series of Josquin Masses has been a treat for fans of both the ensemble and the composer. Like Tallis, Josquin is a composer prone to dryness in performance. There are elegant textures and harmonies, but there is always a risk that by concentrating on the complexities of the counterpoint these moments of beauty will be passed by. Not so here. The elegance of the sound is second to none. Yet the choir is small and the performance practice - tempos, rubato, tone - is as strict as any. The two masses are very different works. Missa De beata virgine was apparently the most popular of Josquin's masses during his lifetime, which comes as a surprise, not so much for a lack of quality as for a lack of coherence and identity. The separate movements are each based on different, and musically unrelated, Marian chants. While the Kyrie and Gloria are in four parts, the rest of the mass is in five. The contrapuntal techniques are also unusually complex, even for Josquin. Missa Ave maris stella is more typical of the composer. It is based on a single chant, and its textures are both simpler and more varied in their density. If anything, the contrast between the two works has the effect of highlighting the unusual construction and sound of the former. But both are mature Josquin. Stylistic features suggest Ave maris stella is the earlier of the two, but both are up to the high standards of contrapuntal flow and ingenuity for which he was rightly famous. Between the two masses is the so-called Cambrai Credo. This is quite an extrovert setting, with often dense contrapuntal textures. But it bridges the stylistic gap between the two masses well. It is as complex as the former, yet as accessible as the latter. The Tallis Scholars sing two to a part, which sounds just about ideal. The alto lines are taken by one female and one male singer, which if anything adds richness to the sound rather making it seem like a compromise. The long-running debate about singing this music at the written pitch or a fourth higher seems to have been settled conclusively in the case of De beata virgine by the low tessitura of the music, especially in the Credo, which requires transposition to be performable by anybody. Josquin's music is well served on this recording, which is at least as interesting and satisfying as any of the previous releases in the series. De beata virgine is particularly interesting, given its stylistic distance from the rest of the cycle, and the curious fact that it was so popular in its day, despite - or perhaps because of - its musical complexities. Anybody with the technology and inclination to download this or any of the Tallis Scholars' other recent releases may be interested to know that they are available on the group's website in a wide range of formats and file sizes. The largest is 24 bit, 96 kHz 5.1 surround. If the sound quality on this CD is anything to go by, that high res version promises to be a very satisfying listening experience indeed.